The Frigidaire FAQE7017KW electric dryer has a huge 7.0 cu. ft. capacity and practical features such as its DrySense Technology. It has also earned an NSF certification. The DrySense Technology aids in giving you completely dried laundry without the ugly wrinkles. The NSF certification and the Sanitize temperature settings of this dryer ensure that your laundry always comes out of the dryer free from bacteria and other allergens. This Fits-More dryer at 7.0 cu. ft. is built for heavy duty washing. Its TimeWise Technology keeps you from waiting too long before your laundry dries completely, as wash time is equivalent to that of dry time. The DrySense Technology delivers precise drying results everytime, through the use of sensitive moisture sensors. These sensors eliminate moisture without wrinkling your clothes. The Save Your Settings feature saves you more time and keeps you from guessing during your next drying session, as this dryer remembers your previous settings and automatically saves them. The Quick Cycle option allows you to easily dry a few items for as short as 25 minutes. Choose from 7 different dry cycles, temperature options, and 4 dryness level selections. Cycle features include Heavy, Casual, and Delicate while temperature options range from Low to High. The 4 dryness level selections start from Damp Dry to More Dry. Other convenience features of this dryer include Control Lock, Drum Light, and Precision Moisture Sensor. This dryer is available in different colors, from Classic White and Classic Black to Classic Silver, Classic Blue, and Classic Red. The Cycle Signal Lights aids in the easy monitoring of each cycle. The Express Select Controls help in setting the right options and temperature settings for different cycles. Dry a few items within a short time as the Quick Cycle allows you to do so in just a quick span of 25 minutes. 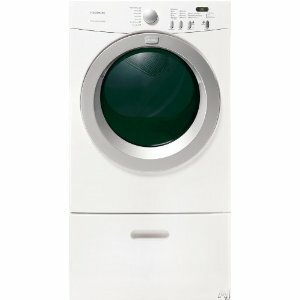 Accommodate more clothes and other items in your laundry as this standard-size dryer has a built-in capacity of 7.0 cu. ft. Choose the needed options and cycles by touching a few buttons through its Express-Select controls. Choose from seven different cycles and four different dryness level selections to cater to your drying needs. Start each cycle whenever you're ready through the Safety Start or Push to Start button. Keep the settings uniform throughout each cycle through the Control Lock feature. Be alerted whenever each cycle is finished through the audible End of Cycle chime. This dryer does not come with a dry rack. A dry rack is useful in drying non-traditional laundry items. Unlike other Frigidaire dryer models, this dryer does not have the Steam Cycle Option, useful in eliminating wrinkles and refreshing clothes. There has been no Energy Rating or CEE Rating given to this particular dryer model.